The CDE M4500 plant at Al Ourifan in Kuwait. 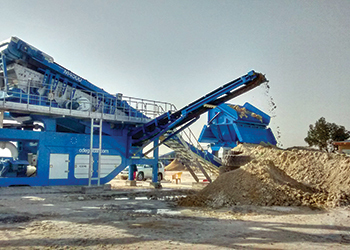 Al Ourifan, a Kuwaiti construction company and quarry operator, has recently upgraded its CDE sand washing installation with a higher capacity modular plant, which has enhanced its capacity to meet client demands in terms of quality, quantity and speed of delivery. The CDE M4500 unit offers feeding, screening, sand washing and stockpiling all on one compact chassis. 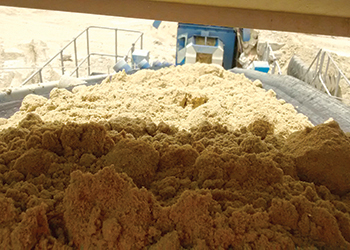 Three years ago, the company – which provides aggregate materials for the local building industry – purchased a CDE M2500 E3X sand washing plant to treat raw wadi sand in order to obtain 0-5 mm washed sand. Within a year of successful commissioning, Al Ourifan’s owners decided to purchase a powerful upgrade of their existing M2500 wash plant that would allow the company to increase production and diversify its offering by adding 0-5 mm washed concrete sand to its portfolio. The CDE M4500, commissioned in April 2016 to run alongside the M2500, has dramatically increased Al Ourifan’s capacity by injecting an extra 200 tonne-per-hour dimension to its sand washing operations. Today Al Ourifan’s M2500 produces 100 tonnes per hour (tph) of washed sand whilst its M4500 produces 200 tph of concrete sand, enabling the company to meet client requirements in terms of quantity, quality and speed of delivery. “Our CDE M2500 had proven to be an excellent choice in terms of reliability in production of different grades of sand and return on investment. When demand started to grow beyond the capacity of the M2500, we naturally turned to CDE for an upgrade,” says Ourifan. 200 tph of washed concrete sand through the M4500. Designed to accommodate an ‘all in’ feed of material to wash and grade three different types of material simultaneously, the M4500 presents opportunities for significant returns on investment through increased production of quality sands and maximum efficiency. With a capacity of 450 tonnes of materials per hour, the M4500 is a higher-capacity evolution of the M2500. • Water: Al Ourifan’s M4500 processes 220 tonnes of material per hour. To ensure optimal efficiency in a dry environment where every drop of water matters, the company has installed a CDE AquaCycle, a highly-effective water recovery system benefiting both the business and the environment. 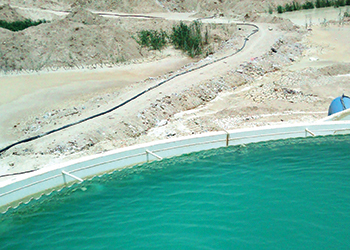 “The issue of water availability is a primary concern for all construction companies and quarries in Kuwait and lack of water is a deal breaker where sand washing operations are concerned,” Ourifan explains. • Energy: Garg adds: “Water and energy consumption costs are a significant factor in the running of a sand washing operation and directly impact on the customer’s return on investment. The addition of the CDE AquaCycle to the Al Ourifan plant ensures that our customer has complete control over his operations because he manages his water in an optimal manner by recycling up to 90 per cent of the waste water in his plant. AquaCycle ... enables recycling up to 90 per cent of the waste water. • Time: The M4500 stockpiles the final products, after processing and classification, through the inclusion of three integrated stockpile conveyors and a radial conveyor to ensure maximal stockpile capacity, eliminate unnecessary double handling of the material and reduce vehicle movements on site, bringing additional cost savings. The integrated dewatering screen on the integrated EvoWash sand washing plant also allows for the material to be much drier and ready for sale faster. The elimination of fines loss makes it easier to manage ponds and reduce maintenance costs. Substantial savings on the running of the installation coupled with its built-to-last modular design means that CDE sand washing systems are always a winning choice in terms of reliability, flexibility, and return on investment, Garg remarks. “Our experts work closely with clients on location to design and develop the most efficient and value-for-money installations,” Garg continues. “As CDE Global builds installations in its dedicated production facilities in Northern Ireland, the final product is tailor-made to each client’s exact specifications. This ability to control the product from start to finish is key to delivering tailor-made turnkey plants that will take minimum installation time and produce high returns on investment. “The flexibility offered by the CDE equipment is also a very attractive proposition to companies that want the option to expand their operations in the future. Al Ourifan is a case in point,” he concludes. CDE Global is a leading provider of washing equipment for quarries, mines and recycling operations on the global market.